Theses versatile, standard patient gowns have a straight back, and have a closure at the neck and mid back. The double tie over back allow for utmost modesty for the patient and easy comfortable wear. The gowns fit all sizes, up to 2XL. The fabric is long lasting and durable, being that it is made of 55% cotton, and 45% polyester. This is the perfect gown for long stays. The double ties in the back help preserve the patient's modest and comfort, while making it extremely easy to wear and change. 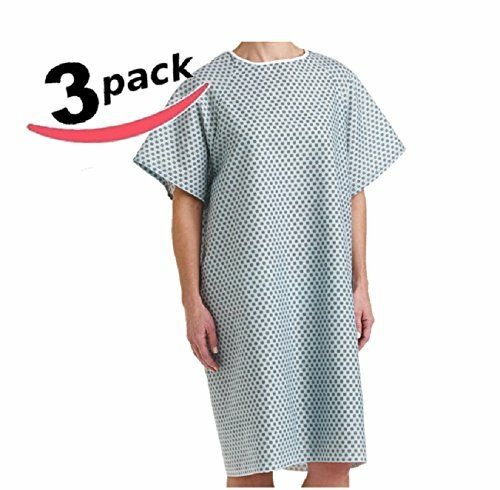 If you are not satisfied with the 3pk Hospital Unisex Patient Gown, just return it within 30 days, for a refund. HOSPITAL GOWNS FOR WOMEN AND MEN: 3 PK, Unisex versatile hospital gown. Perfect for long stays, machine wash.
EAST AND COMFORTALE TO WEAR: the double tie over back allows for patient modest. The gowns are made of 55% cotton, and 45% polyester. STANDARD HOSPITAL GOWNS: These standard, versatile straight back gowns have a convenient tie closure at neck and also in the mid-back. ONE SIZE FITS ALL: This gown fit all sizes up to 2Xl. This is the average gown given at the hospitals. If you have any questions about this product by BELLA KLINE DESIGN, contact us by completing and submitting the form below. If you are looking for a specif part number, please include it with your message.